If you want to host your website as soon as possible and you do not have any hosting services or have not yet purchased it, then today I will give you the world's number. I'm going to tell you about 1 and Free Hosting. 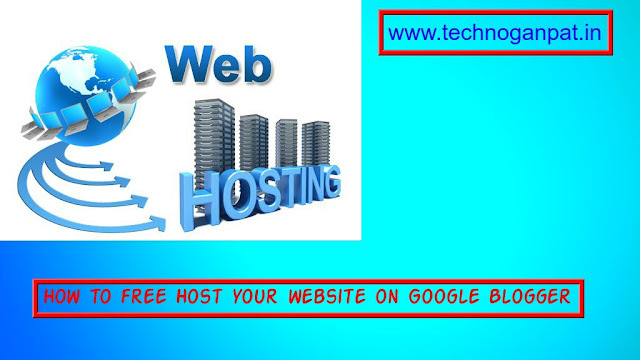 You will know that you need hosting to run your website. And web hosting starts in the market by 50 / - per month, which is quite low but it does not depend on how powerful its servers are and how much of their time is up, that their servers do not always remain down. If you want your hosting server to be the fastest 100% up time and there is a secure server then this post is for you. World's no. 1 Web site Google.com gives you this for free by Google Blogger, I am going to tell you step by step below how you will host your website in Blogger. 👉 Firstly, you have to be signedin on Blogger.com, you can use any of your Google Accounts such as your Gmail account, follow the steps given below as soon as you sign in. 👉 Click New Blog option. 👉 Write your blog's title. 👉 Type the address of the blog and click on Template created and Create blog option. 👉 Go to setting up your blog, click on the blog address + Setup 3rd party URL for your blog. 👉 Type the domain URL, and click Save Button. After that you have to verify your domain and have to set 2 CNAMEs in your domain's DNS Management (where you have registered your domain) which Google will give you after clicking on Save Button. After setting the CNAMEs, click the Save button again, as soon as the domain is verified, you can start designing and reducing the content publishing of your website. What is RAM ? How many types are it?